Courtyard by Marriott Charlotte City Center offers ideal accommodations for out-of-town wedding guests. *NEWLY RENOVATED * Situated in the heart of Charlotte’s uptown financial and entertainment district, The upscale Courtyard by Marriott Charlotte City Center hotel is perfect for leisure travel. Centrally located in Center City. The Courtyard Charlotte City Center is the perfect location to host your wedding guests. We are conveniently located near several of Charlotte’s most distinguished wedding and reception venues. Our property is directly across the street from The Atrium and The Plaza at Two Wachovia Center, both which connect to The Green. Our building also connects to the South Tryon Square, Bentley’s on 27, and Founder’s Hall. We are only a few blocks from Roof with a View, Saint Mary’s Chapel, The Grace Event Center, and Spirit Square. We are a short drive from The Big Chill, Great Aunt Stella Center, The Palmer Building, The VanLandingham Estate, and The Morehead Inn. Your guests will be pleased to be within walking and driving distance to beautiful and historic Charlotte churches of various denominations. Your guests will treasure their stay while enjoying your special occasion. Center City Charlotte also provides numerous opportunities for your guests to be entertained. Our property is located just two and a half blocks from Charlotte's newest dining and entertainment complex, the EpiCentre. We are also only three short blocks from the Time Warner Cable Arena, home of the Charlotte Bobcats, and only four blocks from Bank of America Stadium, home of the Carolina Panthers. This Charlotte hotel creates the perfect setting for you and your guests. Experience all that Uptown Charlotte has to offer at the Courtyard by Marriott Charlotte City Center hotel. 578 square feet, sink, speakerphone, TV, complimentary high speed wireless internet and electrical outlets throughout. 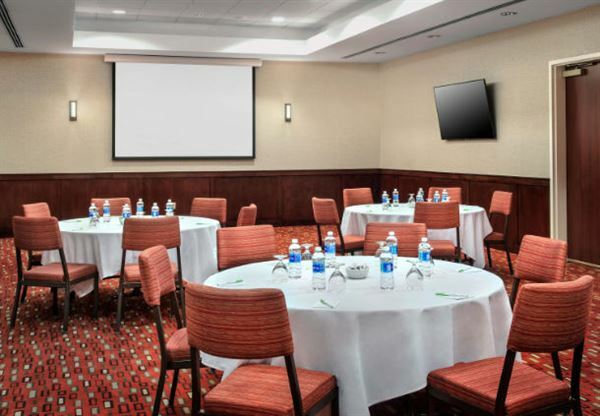 The boardrooms are easily accessible by connecting standard king rooms on each side. Special Features: With attractive and comfortable guest room accommodations, the Courtyard by Marriott Charlotte City Center hotel is sure to meet your needs. Discovery Place Science offers creative, intelligent and fun spaces for your event. From board meetings to large banquets, the Museum’s unique setting ensures a successful event every time. Whether you need one room with smart technology or the whole Museum, our experienced staff will take care of all of the details to create a customized experience.